Having started the year engulfed with a myriad of problems - from fuel shortages, soaring prices of goods and services, shortages of drugs to labour disputes - the Daily News on Sunday's Assistant Editor Maxwell Sibanda sought comments from a number of analysts just to find from them where they think President Emmerson Mnangagwa and his government are leading us to. Mcdonald Lewanika, a political analyst, believes while government does not have much money, people would be more understanding if the little that is there is used wisely and distributed to key social sectors. Also, government needs to play the long game by not expecting to reap where it did not sow. "For as long as the productive sector is operating sub optimally, there will be no jobs created and no revenue generated. "Right now it's the people with formal jobs who are striking, remember that these are just a small proportion of the working class - the bulk of us do not even have jobs where we can down tools - that is a more potent powder keg and if Mnangagwa doesn't do anything it will soon burst," he said. Maxwell Saungweme, a political analyst, said the 2019 prognosis is bleak, asymptomatic of an economy in a crisis. He reasons that there are pains that must be expected, in most cases worse pains than the crisis pains, then relief later. "You can't take an economy on zero or negative base and you turn in around without pains. We are paying as citizens for the debts, misdeeds and irresponsible actions of former president Robert Mugabe, Mnangagwa and Zanu-PF in the past. The raft of measures (Finance minister) Mthuli (Ncube) and others put in place will yield results if there is political will. We just need to give them time as there is no painless economic turnaround," said Saungweme. Piers Pigou, a political analyst, said it is not clear if anyone knows where this is leading. "How much of this was predictable? The slide on the value of RTGS and bond notes has been predicted for some time. This Zanu-PF government along with its previous administrations is directly responsible for the financial delinquency. "While many argue that Zimbabwe has the capacity for recovery, the questions remain; at what cost and to who? Well this administration be able to deal with the hard reforms that address the skewed polygonal economy, but that underwrites prospects for a sustainable and broad based recovery," he said. Tabani Moyo, the Crisis Coalition spokesperson, said when Mugabe was asked about his successor, he was quick to point out that Mnangagwa and Joice Mujuru were not capable of running the State. "Few days ago, former secretary in Mugabe's office Lawrence Kamwi revealed the alleged daggers of the cartel that held Mugabe hostage for personal narrow financial gains. This is the unfortunate situation in which Zimbabwe finds herself in, to the extent that the country can burn and the leaders do not fling. "The whole crisis revolves around the fact that the country is not earning foreign currency, yet it trades on surrogate currency on the false pretext that the bond note and the RTGS are 1-1 when the reality is that the engine is now overheated. Civil service need to be paid in forex, just like every other arm of the labour and business in the country. "But Mnangagwa and his government do not want to address this reality because they want to continue paying the civil service with pittance and accessing forex for free through the surrogate currency," said Moyo. Obert Gutu, a lawyer and politician, said Zimbabwe has been in a total mess for almost four decades and it will not be easy to fix the mess and to get the country to the next level. "Hard and painful decisions will have to be made. Long-time friendships might have to be broken as Mnangagwa strives to bring sanity into Zimbabwe's socio-economic trajectory. "Corruption is the elephant in the room and to be very honest with you, so far, very little concrete and tangible action has been taken by the government to deal with this scourge. Looters and wheeler dealers are still moving up and up official government corridors," said Gutu. Tawanda Chimhini, director of the Election Resource Centre, said almost six months after the 2018 elections, there is no excuse why election promises are still to be delivered. "If they are still being worked on, at least some solid plan should be shared with the voters to convince them that those in office can deliver on their promises. "Having assumed power after elections, the administration should be able to prioritise that which is being raised as concerns by citizens. "The State as led by the administration has constitutional responsibilities including good governance, national unity, peace and stability and fostering fundamental rights and freedoms among others," said Chimhini. Vivid Gwede, a political analyst, said there is a clear crisis in terms of the government's finances. "While the government is already spending more than three quarters of its revenue on recurrent expenditure, the cost of living has risen in the past months. "This rise in the cost of living has led to eroded incomes for civil servants who are now asking for pay rise. "For a government saddled with a huge debt, that is a nightmare. There is need for broad-based social dialogue in Zimbabwe that will address the lack of confidence in the economy and lead to a collective national approach to dealing with the problems. "Any reference by the ruling party to a mandate supposedly given in disputed elections as the sole basis of who should contribute to national reconstruction after post-Mugabe is self-destructive and retrogressive," said Gwede. Rejoice Ngwenya, a social analyst, believes Mnangagwa and his government could be leading us to one thing - another revolution. He said: "There is no government or country that can sustain this much pressure without a popular uprising. "He does not have an idea how to resolve the issues because he thinks governments run economies. The solution is one; let the market decide. For now, Zimbabweans should gear themselves for another uprising". 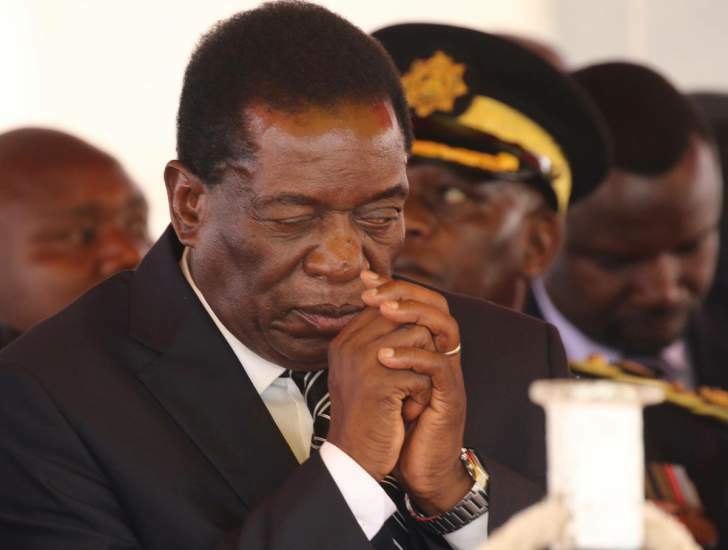 Precious Shumba, Harare Residents Trust director, said Mnangagwa is clueless as a leader shooting in the dark, based on how he has responded to the different challenges facing industry, manufacturers, civil servants, hospital doctors and health personnel, politics and the economy. "Instead of presenting the nation with one solid plan to demonstrate capacity to lead Zimbabwe, he is giving the nation so much unpredictability such that it is extremely difficult to anticipate what he will do next. There is abundant corruption in his government, linked to the fuel cartels, lack of progress on several key projects announced when he came in, and the Government is disjointed on how to address the issues. Stanley Kwenda, a journalist, said whichever way we want to look at it; there are no quick fixes to the Zimbabwean problem. "First thing first, we have to look back and interrogate where things went wrong. We can't fix what we don't know. "The Zanu-PF government inherited a very strong economy at independence, whose currency was at par with the British pound and stronger than the US dollar. "Our economy was very strong with a thriving manufacturing base. We exported leaving surplus and that was way before sanctions. "Since then it has been a downward slope of destruction. We need a national dialogue to first identify and acknowledge where things went wrong, accept our mistakes and start a plan to rebuild. "If we don't acknowledge the mistakes of the past we will continue blaming sanctions and never will learn anything," said Kwenda.